On shaped circular stepped bases with dentilated and reed and trefoil bands, rising to fluted tapering and knopped stems headed by octagonal shoulders and with circular campana-shaped sockets with removable reeded and shell nozzles. Struck on bases, sockets and nozzles; with the charge and discharges of Antoine Leschaudel. 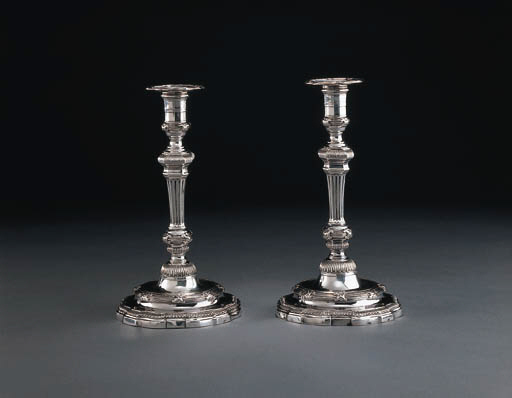 An identical pair of candlesticks by the same maker, also of 1745 and possibly the present examples, was formerly in the Puiforcat Collection and illustrated in Nocq, Le Poinçon de Paris, 1968, vol. III, p. 157. Loir was of the distinguished family of Parisian goldsmiths. He is recorded as early as 1733 living on the quai des Orfèvres and died before 1775.